This is our third week of a series we are calling, “More than All Others.” In the reading from Mark, Jesus speaking about a poor widow who gave only two coins to the offertory, said she gave more than all others. It is a great honor and respect from Jesus and it is the approach we should have in all we do for the kingdom of God. It is not an approach to a competition for the Kingdom of God, it is merely a goal for each of us. The second week we looked at the readings with an eye toward giving. We see stories of widows, who had nothing giving all they have because of their faith. Widows were very dependent on some male member of their husband’s family or even their own son to be able to survive. Some Rabbis shared a biblical view that a woman only has two proper roles, an unmarried virgin in her father’s house, or a child producing wife in her husband’s or her husbands’ family’s home. Yet, God uses widow’s as his messengers. 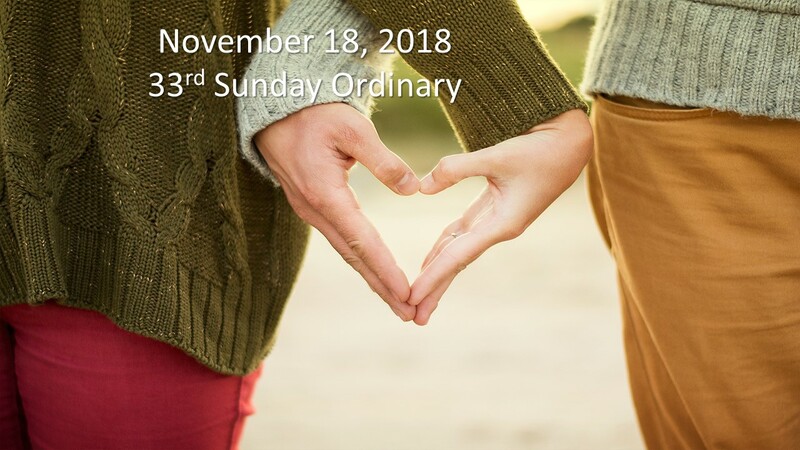 The readings this week are from the Lectionary for the Thirty-second Sunday in Ordinary time; the readings are; Daniel 12:1-3; Psalms 16:5, 8, 9-10, 11; Hebrews 10:11-14, 18 and Mark 13:24-32. Each of these readings gives witness to resurrection and how to be ready to rise. First we will look at each reading. look at judgement and destiny and then how we are able to rise. But not just how we want to rise, but how when we rise we do so more than all others. The first reading from Daniel, a prophet is speaking about his vision which he believes is from God to share. It is a vision about the fall of the persecutor (Evil One, Satan) and the great Archangel Michael mediating for the people. It is vision about the end of earthly time. Those who are written in the book (sometimes book of life or truth,) a heavenly book in which future events are already recorded, shall escape. Although not defined it is presumed they will escape death. Daniel continues saying those asleep will wake, some to live forever, others to horror and disgrace. Those who are wise will be in splendor forever, and those who lead others to justice will be stars forever. It is a vision about the end of time and judgement. Michael leads the rising of the people but he is not the judge. We Christians know from Jesus that he will be the judge. I want to make the point here that we are not simply judged in a binary fashion, yes or no, but how we live is considered for possible further reward. More on this later. In the gospel Mark is portraying a dark picture, a time of tribulation. For the early followers, Jesus death was a tribulation, a time when the sun darkened. But Mark goes on to say much will pass away in a generation. He could be speaking about the destruction of the temple which did pass away within a generation of Jesus death. The loss of the temple forever would have been losing God for the devout Hebrew, it was the end. We also see that the Son of Man will be coming in a cloud, this is how Jesus referred to himself, language taken from the prophet Daniel of our first reading. This is viewed as an end of time message, Jesus coming to gather the good and saved. It is possibly a message of the time of judgement in Jesus Second Coming. However we can’t be sure when it will occur; Jesus admits even he did not know the day or the hour. But we can be sure there is a time when time will end. This en time is characterized with signs of dark, falling stars and a shaking in heaven (which indicates it is not just an earthly end of time.) We should recognized these signs as we do when we see a tree coming alive in spring. The first Christians felt Jesus would return within a generation. We probably think it will not be in our life time. But it will happen, being always ready is wise. We are looking at these three readings from the view that there is an end of time and there will be a judgement. Within this end of time we have been offered a resurrection from the great High Priest who offered a sacrifice and then rose to lead the way. Whether dead or alive in these final times, we will be judged, first to live eternally (or not) and then to receive reward based on how we have lived our life. We don’t have much information on how this final time will go, but we know to be ready. We also know as disciples we must live more than all others to receive great reward eternally. This message is forward looking, highlighting how we think about our destiny will determine how we live today. A destiny of a rich rewarding eternal life should motivate us to want to live more than all others and rise more than all others. What happens when we die? Immediately our soul leaves our body and we are rewarded immediately in accordance with our works and faith. Each person receives their eternal retribution in their immortal soul at the very moment of death, in a judgement their life is reviewed by Christ and it is decided if their is entrance into the blessedness of heaven or everlasting damnation. What is heaven? To live in heaven is “to be with Christ” (Philippians 1:23) where we retain our true identity even our own name. This message is confirmed in the reading from Hebrews, “it is appointed that human beings die once, and after this the judgment,” (Hebrews 9:27). Although the Book of Revelations is a vision it is possible to imagine seeing two throne images in eternal life, the first throne in the throne room we could see immediately after we die, our first judgement and the second throne, the white throne without any sky or land could be what we see at the second coming and final judgement. In the final judgement scene we see the book of life is read, those dead were judged according to their deeds. Many believe to get your name in the book of life you must know Jesus, have faith and believe in His works. This is all very possible, as John tells us God is love, so if we love than we know and our name is entered into the book of life. Beyond the judgement of heaven or damnation there is a belief that those in heaven will be rewarded for their deeds. Paul writes, “For we must all appear before the judgment seat of Christ, so that each one may receive recompense, according to what he did in the body, whether good or evil.” (2 Corinthians 5:10) Somehow our deeds will be rewarded, heaven can be more than “with Christ,” there is reward. Jesus told his disciples in his Father’s house there are many dwelling places and he was preparing a place for them. (John 14:2) From the reading of Daniel we recall, those who are wise will be in splendor forever, and those who lead others to justice will be stars forever. It appears life with Christ is more than floating around with nothing to do. There are dwelling places, there are rewards, there is being face to face with Christ. Thanks to the sacrifice of the great High Priest Jesus our destiny is filled with hope, we have much to look forward too. We don’t really know how the first and second judgement will go, we don’t actually know how or where they will take place. What I have described is based on some interpretation from various authors, the Revelations of John, writings of Paul and what Jesus has said. The readings of Daniel and Mark describe more in terms of the Second Coming. Is this the absolutely right interpretation, I prayerfully submit it, but we are talking about things that we can only wait and see to be sure. I wish you all God’s speed. What we do know is that we will be judged, with judgement comes justice, and reward. So how do we live? We haven’t talked much about the fact that in these visions we are going to rise. First at our death our bodies will lay on the earth and our souls we be separated and meet Christ, our soul will rise. At the end of time we will be reunited soul and body and rise to our final destination. We have every hope that it will be all good. But, there is the mention of the “pool of fire” which does not sound like a good end. If we end up with Christ there is still the possibility of additional reward. We want to rise as high as we can at death and in judgement, so as our theme message reminds us we should be more than all others. We should live a life worthy of great reward. Jesus commands to love God and love others. This should not simply mean we love them by doing no harm, and wish for their good always. First, loving God should mean we love and respect God more than all others we love and respect, we want to do his will, we want to discover all we can about him, we want to be like Jesus in our obedience, our love is not passive it is very actively being the image of God in our day to day life. Second, to love others does not mean just being kind to them and doing them no harm, rather it means we ache for their best life, we want them to have more than we have ourselves, we help and support them in all life’s needs, they never have to fear loneliness or poverty or sickness because we act when something happens to them, we love them more than all others. If our destiny has the possibility for great reward our life should be a work that knows that great reward is possible. It means doing more than all others, giving our last coin, giving our life, giving clothing, food, water, presence, a place to live. Loving others is not passive, we are very actively in their lives helping where we are needed. With a destiny that is rich we should live a life that is rich in faith and putting into practice all that Jesus taught. We should be loving more than all others. We will rise at death, we will rise when Jesus comes again. With all that as a promise we should rise every day seeking to be the lover that God needs in our community, home and in our intimate relationships. We can be more than all others and when we rise we will rise above all others.